Tragically, many people look at the soil beneath our feet and only see ‘dirt’. They are missing the fact that soils contribute so much to nature and our lives. Soils fuel our forests, grasslands, and crops; certain soils enthusiasts may even say they are the basis of life on the planet. What happens when humans alter soils from their natural state? How can we impact our surroundings simply by changing the chemistry or physical characteristics of soil? Researchers in Cottbus, Germany, are asking these questions by investigating a unique case of anthropogenic soils and forest ecology in the Northeastern US and Europe. In midnineteenth century America, large ironworks facilities with charcoal iron furnaces popped up all over the northeast, increasing the energy needs of the region. Charcoal hearths were a simple solution that provided required fuel throughout the northeast region of the US and parts of Europe. As you can see in the satellite image of hearth sites in Germany, they are abundant. 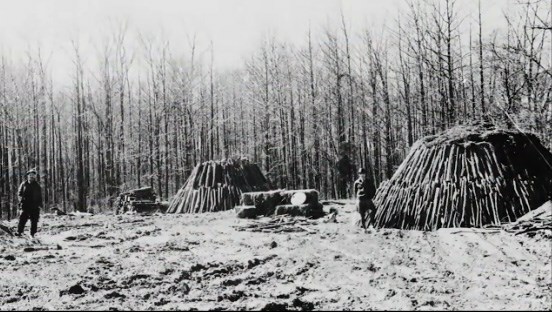 Portions of forests near the sites were cleared every 20-30 years and workers gathered the wood to be transformed into charcoal. Logs were piled onto large platforms anywhere from eight to thirty meters in diameter, and were burned near the ironworks facility to produce charcoal. This charcoal was then removed and brought to the ironworks to be used as fuel. What are human-altered soils like? Soils near these charcoal preparation sites collected residual materials, like charcoal pieces and ash. The burning process also changed the existing soils surrounding the hearth. The weight of the logs compacted the soils underneath and the high heat from burning altered the chemical and physical properties of the soil which could interrupt or change water flow beneath the soil surface. The new soil layer in those locations had an altered structure; residual charcoal pieces have a different grain size or shape, so they fit together in a new way to create unique pore space sizes and patterns within the soil layer. In addition, the charcoal soils had an altered chemical makeup from the heat and those burned materials tend to repel water, causing it to run quickly through the soil and may not be absorbed or stored near the soil surface. Altered soils also tend to have more significant preferential flow paths for liquids, meaning that rainwater will infiltrate quickly through limited connected pore spaces and a large volume of the soils will not become wet when water is applied. Because plants rely on available water to grow and reproduce, water storage capacity of the soil will control what plants can settle and thrive in an area. Trees that require large amounts of water may not be able to survive through dry periods in charcoal soils because water storage is so poor, and they will be replaced with a species that can survive in the altered conditions. In some cases, the physical and chemical changes from charcoal burning can alter water availability so much that there is still evidence of charcoal hearths in the trees that occupy heavily used areas today. In a study published in 2018, researchers used dyes to observe how water flows through soils on former ironworks sites and measured the ability of the soils to hold water. Indeed, they found clear differences in water drainage behavior between undisturbed and charcoal hearth soils. The anthropogenic soils differed from their natural counterparts because they are very variable in the way they react to water when applied, leading to unstable water availability. Water conditions in the soil will have a major impact on which species of trees can live there and how well they will grow over time. We can directly see the impact anthropogenic soils may have by observing tree size and species composition within legacy charcoal hearth sites. Studies concerning charcoal hearths are helping us understand how remnants of pre-industrialized society continues to impact the ecosystems surrounding us today. As we humans continue to engineer our environment in order to accommodate more people and new technology, we must continue to study the long-term results of these anthropogenic impacts.